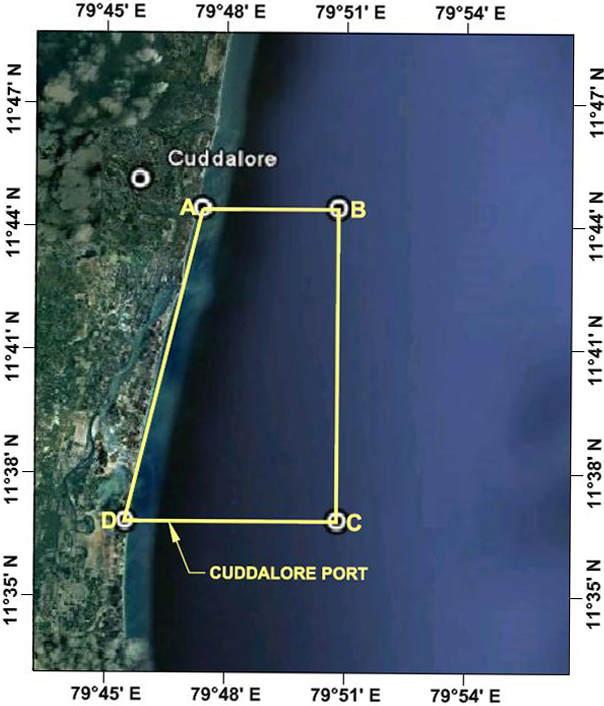 Cuddalore Port is an open roadstead (anchorage) Port situated at the confluence of the rivers Uppanar and Paravanar in the East Coast of Tamil Nadu in the Bay of Bengal. Ships anchor at the open sea at the available depth, loading and unloading of cargo takes place by means of Lighters/Steel Barges. The anchorage has 8-10m depth available at the distance of 0.5 Nautical Mile. Tamil Nadu Maritime Board is in the process of developing the infrastructures (Extension of Breakwater, Construction of Wharf & Capital dredging of the Channel) of the port under Sagarmala / Coastal Berth Scheme with the financial assistance from Government of India. This Port is situated at the confluence of the Rivers Uppanar & Paravanar. The depth available at the Port Entrance is about 2.5 metres at low tide time. About 3-4 m depth is available alongside the wharf. East Coast Road/NH 45 A is just 1.0 Km away. Port is well served with RCC Road Connectivity. Total length of 1132.4 m rehabilitated RCC jetty with fully equipped High Mast illumination is available. It is suitable for handling of General Cargo, Bulk cargo etc. Open stacking area of 18 Acres is available on the northern side with Uppanar wharf and around 45 Acres on the southern side with Paravanar waterfront suitable for multipurpose cargo with well served road connectivity. There are many private owned Steel barges available locally at the capacity of 250 T/400 T so as to handle Liquid/Dry cargo. This Port has a track record of handling cargo @ 5000T/Day. On holidays and out of office hours, on request. A Port lighthouse with flashing light white every 5 Seconds with a duration of one second is exhibited from a white tower on white round house at an elevation of 19 m.
International Code of signals by means of Flag is exhibited. This Port being an anchorage Port, normal working hours are from 0600-1800 hours. But permission for night operation will be considered based upon the prevailing weather conditions. Nominal M.O.T. fees will be applicable for out of office working hours. As per Scale of Rates of Tamil Nadu Maritime Board . Customs, Immigration & Port Health Offices are available at Cuddalore itself. 24 Hours Working Day arrival notice required. Copies of all statutory certificates should be submitted by the agents at the time of making entry. Anchorage position may be obtained from VHF station 24 hours prior to the vessels arrival. Master of the vessel should drop anchor on his own. Experienced Port & Customs registered agents, Stevedores and Ship Chandlers available locally. Launches, Ships provisions, Stores, Spares, Freshwater & Bunkers can be arranged by the above agents. Cuddalore - 607003 Tamil Nadu, India.